Last night, my mom and I went to Sol Azteca in Olney, MD. While the restaurant is not new, the shopping center was newly renovated and we had never noticed the place before. We were greeted with white table cloths and dim lighting, something that added a little feeling of formality that is not commonly found in Mexican restaurants. People don’t usually picture white table cloths when they’re in the mood for tacos, enchiladas, carne asada and guacamole. Still, it was nice. The chips and salsa were perfect. The salsa was fresh and simple, the best I’ve ever had in a restaurant. I could have eated ten more servings of it. The menu was impressive. Not only did they have a wide selection of Mexican favorites (priced generally between $11-14), but also a list of “House Specialties” that were primarily Peruvian and Seafood selections ($15-20). There were so many options, I’ll have to go back to get a better idea of what to recommend to people. We ordered chicken enchiladas, vegetable fajitas, and a cheese chile relleno. All were delicious. The chicken enchiladas were made with corn tortillas, which though not my favorite, are more authentic than the flour variety for enchiladas. My mom really enjoyed her vegetable fajitas, though she did say that the vegetables could have been cut a tad smaller to make it easier to eat. The cheese chile relleno was fabulous. In case you’ve never had one, “chile relleno” means “stuffed chile”. It’s a big green poblano pepper that has been stuffed (usually with cheese and meat), fried in a batter, and smothered in more cheese. Of course, any vehicle for cheese and ranchero sauce is welcome to me. For 2 entrées, an extra side (that was the size of a meal in itself), and dessert, we got out of there for $35. Pretty sweet in this part of Maryland. The portions were so huge we both had lunch for the next day as well. Friday night I had dinner with my mom at Pepino’s in Burtonsville, MD. It’s a cute little family owned Italian restaurant tucked away in the corner of a sleepy shopping center. We’ve been going here ever since we moved into the area in 2002, as it’s not too far from the high school my sister and I went to. I think it finally deserves a blog post. The most impressive thing about Pepino’s is the atmosphere. They really treat you like family. While waiting for a table, we had a lovely conversation with the owner, a very nice lady named Margaret. Another couple of people were also waiting and had no place to sit, so right away she said “Here, sit here and talk to my dad,” and sat them right down with her father. It was so sweet! The food at Pepino’s is Delicious. While you’re waiting, they’ll bring you warm Italian bread. 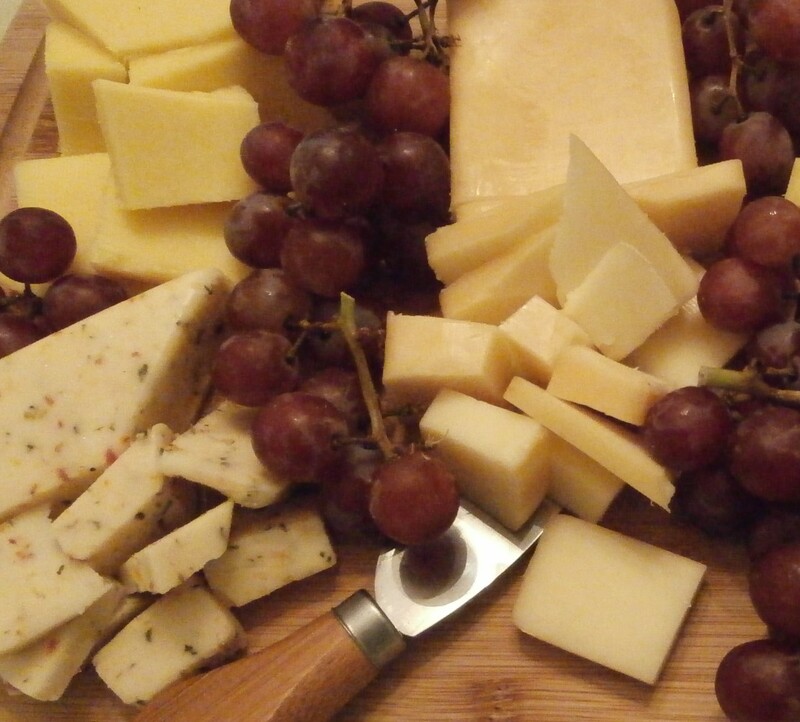 Olive oil and cheese is already on the table: no stinginess there! Pastas are priced around $9-12, with most of the entrée’s at $11-16: pretty comfortable, especially considering the generous portions. My mom had the eggplant parmigiana, which she was raving about. I’m not a huge fan of eggplant, so I went and got the veal parmigiana. Delicious. Cooked perfectly. Smothered in the most delectable homemade sauce you’ll ever get at a restaurant. Slightly on the tangy side. Perfect with the cheese on the table. We were too stuffed to order dessert. I actually had enough left over for lunch the next day, but sadly I forgot to grab my doggie bag. I almost cried when I realized I forgot it. 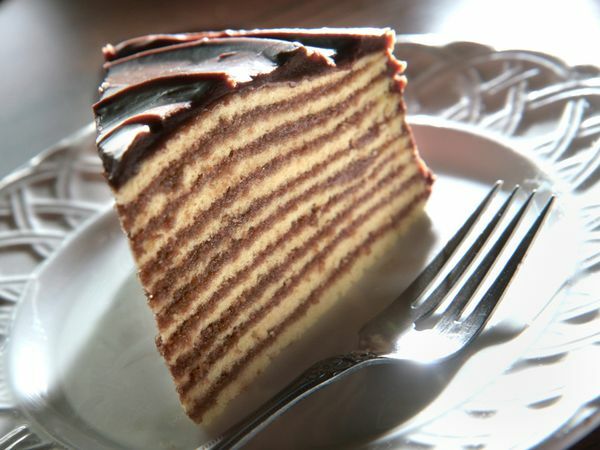 8-15 layers of yellow cake, with fudgey chocolate icing in between. Seriously, this is the richest cake you’ll ever taste. It’s AMAZING! They actually make it by cooking each layer separately in its own cake pan, like 8-10 round cake pans with a tablespoon or two of batter in them. Named in 2008 as the official dessert of the State of Maryland, It comes from Smith Island (go figure), a remote island in the Chesapeake Bay that is only accessible by boat. The remoteness and inaccessibility of the island have made the place somewhat of a time capsule. Discovered by John Smith in the 1600s, the people of Smith Island still retain a sort of Elizabethan dialect, as well as an accent that separates them from the rest of Maryland.